Focus and don’t be afraid of failure (or success). I have ideas, all food, photography and tech related and while I’m still sketching everything out, I need to let a few things go and focus. Even talking with people, I can tell that once I tell them all the things I’m trying to juggle, they feel exhausted for me. And frankly, I feel exhausted. I’m good at saying, “look at me! look at all the things I can do at once! It’s amazing!” However, there’s the voice of my reason (aka my father) who told me that if you’re going to do something half-assed, you might as well not do it all. I’ve been half-assing almost everything and it’s time to stop. It’s time to focus. My book manuscript is due in less than two weeks but after that, I’m taking a break and having a major brainstorming/life-figuring-out session with myself. It’s going to be great. Onto the food! I hesitate even calling this a recipe but I’m hoping to share more of these simple combinations with you. I forget that things that seem kind of “well, duh” aren’t always that way for other people (and the same can be held true in reverse, I’ve been on the receiving end of, “how did you not know that?! ?” many a times.) One of the things I hear most, however, is a need and desire for simple. Slice tomato and arrange on plate. Heat 1 teaspoon olive oil in a skillet and crack egg. Cook egg until desired egg yolk consistency (I board on medium to hard, but occasionally will whip up an over-easy egg). 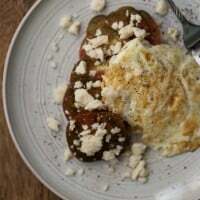 Place fried egg on plate with tomatoes and crumble cheese on top. Sprinkle with salt, pepper, and 1 teaspoon olive oil. Multiply recipe for number of people needed. KISS: Keep it simple sassypants. Love stuff like this whether it’s a weekday or weekend, so good! The best recipes are the ones that barely qualify as recipes. 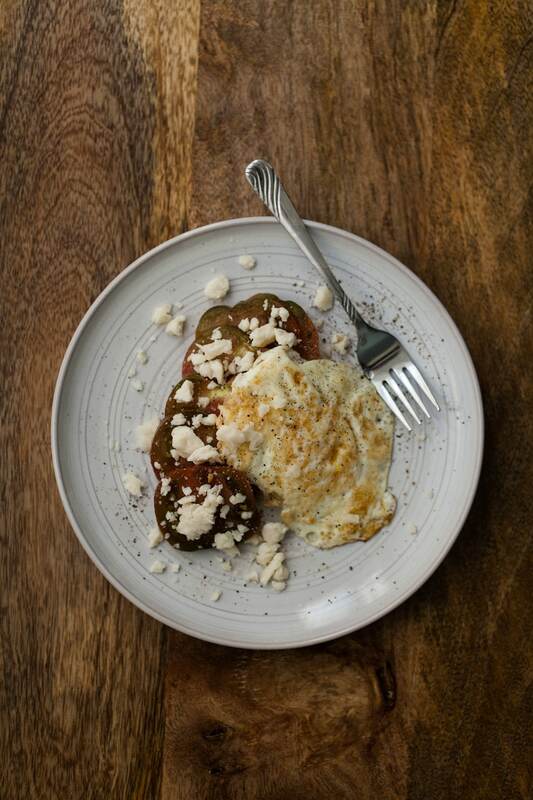 Simple recipes are usually my favorite, and this fried egg looks perfect! Simple recipes are often the most appealing 🙂 I love how you wrote ‘crumbly cheese’, because it leaves it up to the cook to choose whichever one they like best. P.S. Taking time for yourself is wonderful! Yes, please!! Simple recipes are the best! I feel like that all the time! I have so many things I want to do, so many things I’m trying to do, and so many things I know I can do better. It’s tough to juggle but it’s even more tough to figure out which things are worth letting go and which things are worth focusing on. Good luck with everything! 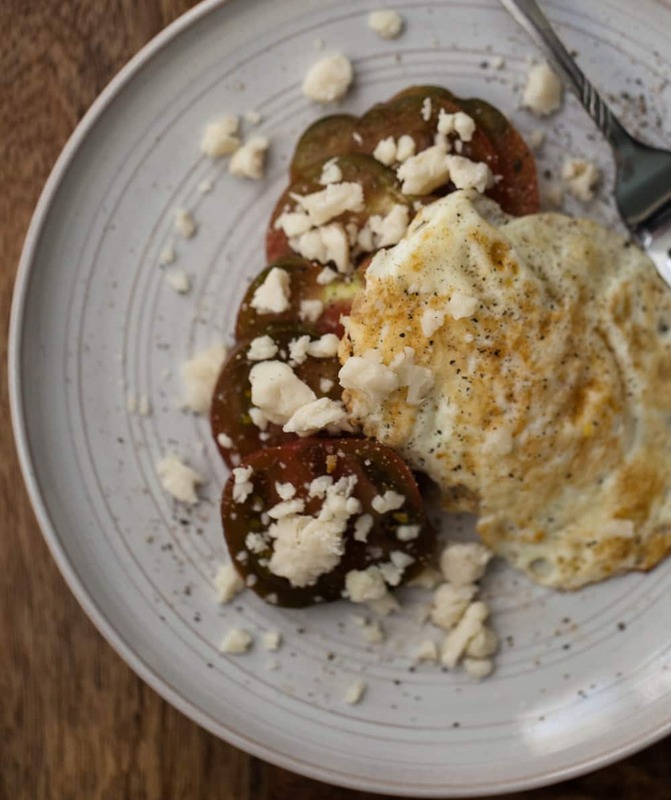 We’re making this tomorrow for breakfast right after we pick the gorgeous heirloom tomato from the garden. I eel like every few months I have one of those moments where I’m like ok, time to regroup. Because I too do quite a bit of multi-tasking and it definitely can get out of hand! Simple always sounds good to me as does a fried egg. Such a great easy meal. Ahhh, yes. I know all of these feelings pretty well. Doing my best these days to focus too. Also trying to build in some time to really take care of myself, and I can assure you that these eggs and tomatoes definitely could fit into that category. Best of luck over the next couple of weeks––can’t wait to see what you create!